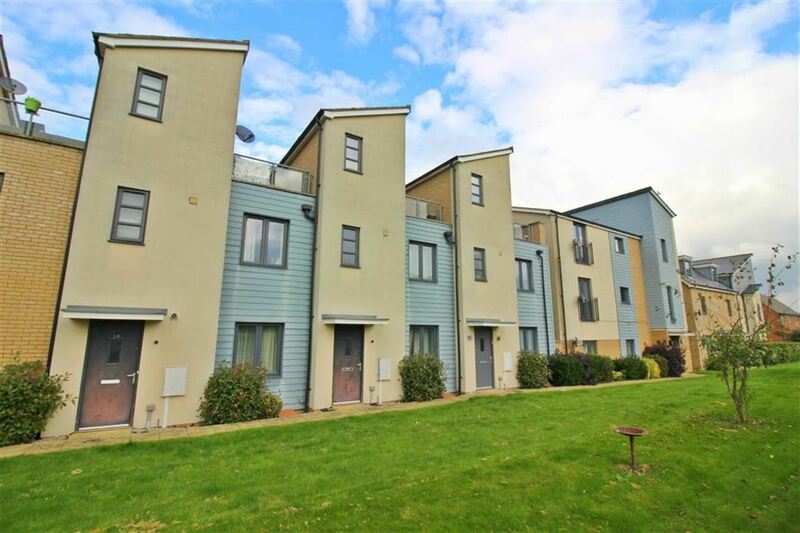 Offered with a FANTASTIC ROOF TERRACE and EXEMPT FROM STAMP DUTY for first time buyers with ALLOCATED PARKING to the rear, DOWNSTAIRS CLOAKROOM, built in wardrobes and OPEN PLAN LIVING SPACE. Offered in great condition throughout this property will be available for a short time only. Its ample accommodation boasts open plan living space, including kitchen, dining and living area, with a cloakroom also to the ground floor. With master bedroom with fitted wardrobes, a second double bedroom and family bathroom to the first floor. Up again, to the second floor which boasts a third bedroom and access to the enormous roof terrace, perfect for lazy days (and nights), after work drinks and evening entertainment. To the outside of the property there is an allocated parking space. This property is to be sold with no upper chain. The new development of Oakridge Park is nestled just off Wolverton Road between New Bradwell and Redhouse Park with Grand Union Canal lining the outskirts of the area. Current facilities include Oakridge Park Medical Centre and local shops nearby in Stantonbury and New Bradwell with new shops now open. Schools in the area include Crosslands Nursery in Stantonbury, Stanton Middle School and Pepper Hill School in Bradville for Primary Education and Stantonbury Campus for Secondary Education. Fitted with a two piece suite comprising of a wash-hand basin and a close coupled WC. The WC also includes tiled splash-backs, a radiator, tiled flooring, double glazed window to rear aspect. Two double glazed windows to rear aspect, radiator, built-in wardrobes with sliding doors. Large decked dual aspect terrace, enclosed by glass balustrade. At the rear of the property is an allocated parking space, with additional visitors parking spaces.